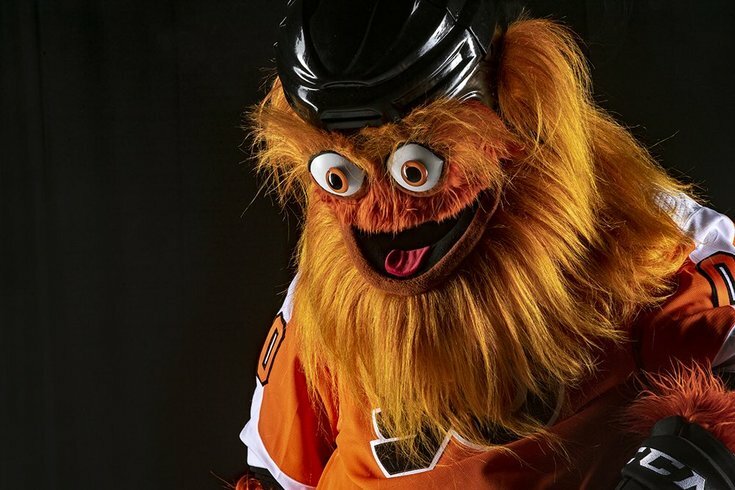 Gritty, the Flyers' new mascot. The extended tour of Gritty's introduction to the world has already hit several late-night television shows, most recently Conan O' Brien's faux unveiling of the man inside the Flyers mascot. In all of these appearances, Gritty has been about as polished as a creature of his appearance can be. In truth, his role as a Philadelphia mascot should probably be more about mercilessly taunting and annoying other teams. For some reason, Gritty was up in New York City on Wednesday hanging out with Barstool Sports' Dave Portnoy, whose over-the-top Patriots fandom is somehow less galling than a Google search of the things he says on a regular basis. The purpose of the appearance was to review the slices at a place called Bravo Pizza. Portnoy and Barstool Sports CEO Erica Nardini founded a pizza review app called One Bite. Almost immediately, Portnoy started talking trash on the Flyers and Philadelphia. Mascots can't talk, so this was set up to be a disaster, but somehow Gritty's demeanor and gesticulations won this argument handily.